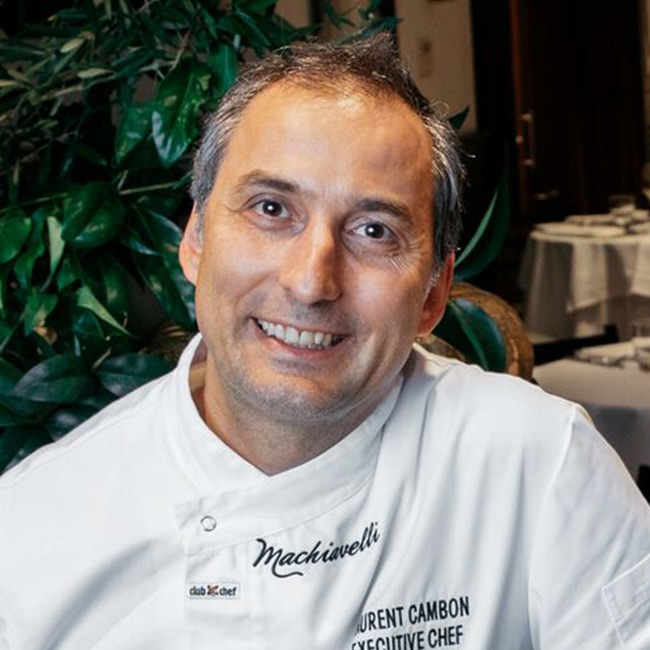 Machiavelli Ristorante Italiano Executive Chef, Laurent Cambon, was born in Limerick, Ireland to French parents. From an early age, Laurent showed a great interest in cooking and could often be found watching his Mother and Grandmother in the kitchen. Growing up, Laurent had extensive exposure to a variety of cuisines due to extensive travel around Europe, and his mother told him, “If you want to travel, become a chef”. Fuelled by this, as well as his love of food, he knew his path was clear. Laurent began his first apprenticeship at Villa Strauss (Napoleon’s Summer House) in Vichy under Alain Passard, France and after finishing in Paris, joined L’Arpege Paris, a two star Michelin restaurant. Following this, he joined the team at Au Trou Gascon with Alain Dutournier, a one star Michelin restaurant, before looking to expand his career in the international hotel scene with Le Meridien Group in Paris in their Michelin starred restaurant. With a desire to travel, and the vast range of experience he gained in France, Laurent made the decision to move to Montreal, Canada where he stayed until moving to Australia in 1992. Once arriving in Sydney, Laurent continued expanding his culinary credentials with the teams at La Grillade then the Intercontinental, Park Lane (now Sheraton on the Park) with Dietmar Sawer. This gave him the local experience he needed to join Machiavelli Ristorante Italiano in 1994. 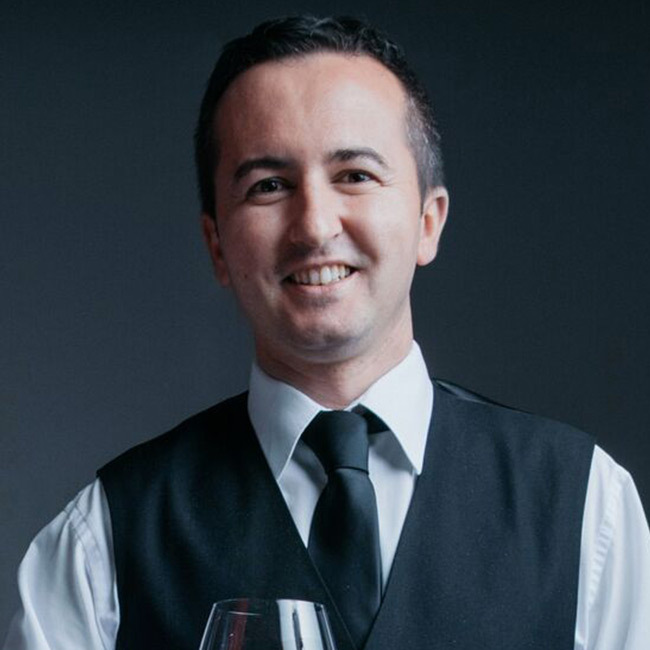 Apart from by a few years where he worked in the Blue Mountains at Silk’s Brasserie Leura and The Rooster Restaurant at Jamison Guest House, Laurent has worked with the team of six at Machiavelli Ristorante Italiano for over 20 years. He leads a team who are as passionate as he is about creating new and exciting dishes, while remaining authentic to the Italian cuisine and the extensive heritage of the restaurant. In the last year, since the restaurant was taken over by Nicolae Bicher, Laurent has introduced a series of daily specials which have proved hugely popular with their loyal clientele including the likes of Barry O’farrell, Mike Munroe, Alan Jones, Peter Fitzsimon and Lindsay Fox to name a few. He has also introduced dessert specials and regularly works with the team to create weekly cocktail specials. 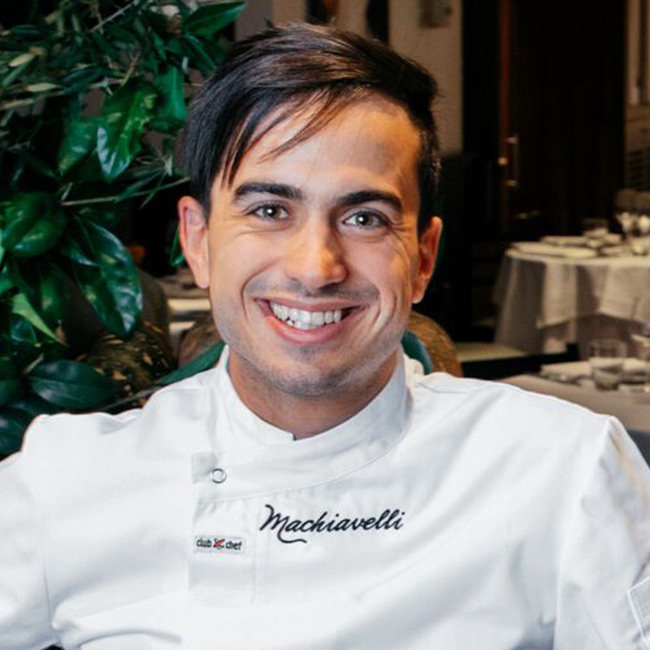 Laurent notes that the most ‘eyebrow raising’ item on the Machiavelli Ristorante Italiano menu is the Gamberoni Avvolti – Queensland prawns wrapped in crispy potato with avocado tartare and acacia honey dressing! Laurent’s love of the hospitality industry is clear to all who meet him. He loves that you never stop learning and are forever evolving and pushing the boundaries by combining ingredients to get flavours that constantly enrich our palate. On a personal level, Laurent has two kids and splits his time between the Blue Mountains and Elizabeth Bay. He says his favourite restaurant outside Machiavelli, and his own kitchen, is Quay. Tell us about your history as a chef. Did you always know what you wanted to do? Did anyone inspire you? Please share your journey as a chef with us. At an early age, as soon as I could stand on a crate and reach the kitchen bench, I loved helping mum preparing the family meals, particularly when she made the fresh pasta and pizza. I can still recall those times in my memory as I felt the texture of the dough in between my fingers “it was my playtime”. My other childhood memory of cooking is my grandmother’s homemade bread coming out of the wood oven, and while sill steaming hot she will drizzle fresh olive oil over it, add a tomato sprinkle some oregano and feed it to us. As I grew stronger I remember her allowing me to fuel the oven with wood and getting me to knead the dough. Wow! I still recall the smells and flavours of those days. As a teenager while still in high school I worked in various restaurant/resorts during the summer holidays. The excitement of food and dining enticed my career’s appetite which lead me to enrol in the hospitality college. During my training as part of the work placement I was sent to Rimini/Tuscany to get knowledge of the northern Italian cuisine which is very much influenced by Italy’s neighbouring countries. The experience opened my heart to the possibilities my chef’s career will create outside my southern Italian life style both in the culinary aspect and travel prospects. Once I finished my training I worked 2 years full time in a 3-star seafood restaurant within my region, this focus has embedded in me the importance of freshness if you want to take advantage of the flavours the sea offers our palate. Lured by the desire to travel I left my Italian oasis and moved to Paris/Cannes to explore the French cuisine. I worked in a 3-star Michelin French/Italian restaurant (Oasis) with a well-known and respected chef Stephane Rainbault. Fuelled by my passion of travelling I set off for the distant land of Australia. My first stopover was Perth where I worked for a brief period in an Italian restaurant and then moved to Darwin and worked in an Australian restaurant. But my eyes were set for Sydney and I arrived at the doorsteps of Machiavelli in 2014 where I was welcomed to join the team. What do you think sets Machiavelli apart from its competitors? It’s history of showcasing a consistent traditional Italian cuisine. How long have you been working at Machiavelli? Who I am today! I have been fortunate to have family, friends and associates who have invested their time in helping me shape both my personal growth and career path. What do you enjoy most about working in the hospitality industry? Cooking! And the joy the food I serve brings to people. Chef (hospitality) Diploma di Cuoco (Italy). Who do you admire in the Australian restaurant industry? Giovanna Toppi! Her business sharpness, her understanding in meeting her diners needs and discipline on how she wanted things done both in the kitchen and on the floor. However, in general my industry idols have always been the head chefs I have worked with because they all offer their unique touch, secret ingredients and food philosophy. I quote a Japanese head chef I worked with in Paris “The learning you share as a chef in a team is not the recipe but the philosophy and experience they bring”. Other than Machiavelli, what is your favourite restaurant? Ciasa Mia Restaurant (Paris) a fusion of French and Italian cuisine. I love how chef Samuel amalgamates dishes with his own personal twist. For example, his tiramisu is a combination of mascarpone ice-cream, coffee froth and gelato pecorino. What is your favourite food, dish? Drink/wine? Pasta Carbonara – But it must be traditionally unadulterated, creamy and juicy. Crustations Aperol Spritz and Cabernet Sauvignon. Tell us something that not many people know about you? Fun facts etc. This is my addition (the interviewer) to all the single ladies – He is Single, Good looking, Romantic and a chef – now if he doesn’t meet the list of Australia’s most wanted bachelor of the year – who does? What are your three tips to any budding chefs? Tell us about your history as a sommelier. Did you always know what you wanted to do? Did anyone inspire you? Please share your journey as a Sommelier with us. A love story birthed in me at the age of 14, I used to travel with my uncle to Oltre-Po’ in Northern Italy where he owned a vineyard, producing wine for his own restaurant. I was fascinated by the work of the vineyard and the degree of attention it needed to yield good wine. I wasn’t allowed to drink so my uncle taught me to identify the underlaying tones and all other characteristics of the wine by smelling it. This early practice developed my sense of smell, and today it is my forte in identifying a good wine from onset. I helped my uncle during summer holidays both on the land with maintenance, production, manufacturing and in the restaurant as a waiter. Working on the land gave me insight on the importance of soil quality, environmental impact and the varieties of grapes needed to achieve the different selection of wines by wine producers. The flexibility and diversity to work between land and restaurant imparted in me a passion for both wine and food and set me on the career path I find myself today. What did you do before working at Machiavelli? Any other restaurant or jobs? Once finishing school, I joined my uncle permanently in his wine production and restaurant business and worked there for 5 years. During this time, I obtained my Diploma of Sommelier from AIS (Associazione Italiana Someliere). I continued to improve my knowledge by researching, attending exhibitions, workshops and winery tours. I wanted to improve my English this lead me to move to England where I worked for 5 years at Sabatini and Coccomos. I continued my research of the wine industry where I learned that Australia had a great production of wine, so I decided to explore this further and arrived here in 2010 where I joined the team at Machiavelli and started as a floor waiter. I was then asked to take care of the wine list and quickly was promoted to the position of sommelier. Apart from its food, history, and the particularity of its diners, the selection of our wine also sets us apart as our aim is boutique oriented. It’s easy to have a large wine list because not much planning or research goes into it. Our boutique wine list is carefully selected from the best regions of Italy. This careful selection extends both to our local produce and our neighbouring New Zealand cousins. The wine we choose must marry with our food menu and daily specials. We review our selections of wines frequently by researching vintage, new releases, characteristics so we stay true to our Boutique objective. There are 1500 varieties of grapes which are unexplored by the Australian market and my job is to identify the best suited to our food and seasons. However, knowledge alone cannot meet this standard it must be inspired by love and passion. Every day is a success because it gives you the opportunity to learn, grow and develop yourself. Clients walking out smiling makes me feel happy because it confirms that I have achieved my objective in giving them a food and wine experience they have enjoyed. Seeing our clients return time after time, because you build a relationship with them as you get to know they favourite food and wine, you meet their friends and family, this is very special! Diploma of Sommelier obtained from AIS (Associazione Italiana Someliere). Also have travelled extensively throughout Australia, New Zealand, Italy and France in order to develop and expand my knowledge of the wine industry.